Wish you could have been in my Creative founder class? You can! I’m teaching an abbreviated version this spring at Stanford Continuing Studies. Or contact me to teach this at your company! In order to get users to change to a new solution, it must be 9 times better than how they solve the problem already. That means sustaining innovation — making a product better — is not sufficient to build a new business. It must be so radically different that users are willing to take on the pain and annoyance of changing products to get the new benefits. 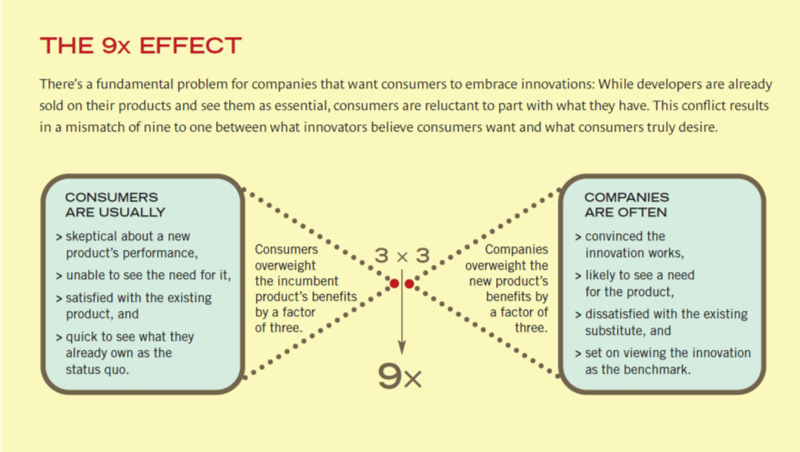 So how can we find our way to a nine-times better product? We have to understand the people in our market better than their own mothers know them. This means two activities: good research and excellent synthesis of that research into actionable learning. Steve Portigal wrote a magnificent book on how to effectively interview, so I will defer to him and simply tell you, go buy Interviewing Users. It will teach you how to plan for and run good customer research interviews. Now on to synthesizing those findings! Fast forward a week or two of doing customer interviews, and you now have pages and pages of notes about the users in your target market. You could just read through them and say, “I’ve got an idea!” Or you could learn to inhabit the data and find the golden truthes that lie within. The following is my process, one I use in both corporate workshops and in my Creative Founder class. Tl;dr — you break the research into small modules, then rearrange them different ways until all their secrets are revealed. In each section, I’ve given the goal, the methodology and the timing for the activity. Timing is important. If you don’t timebox each activity, people will fall into a kind of reverie frequently referred to as “analysis paralysis.” Less time creates focus and keeps participants moving forward. Start with fragmenting: making your data modular. Most of my terms for activites are from Karl Fast, including this one, fragmenting. Karl is a proponent of distributed cognition, i.e. 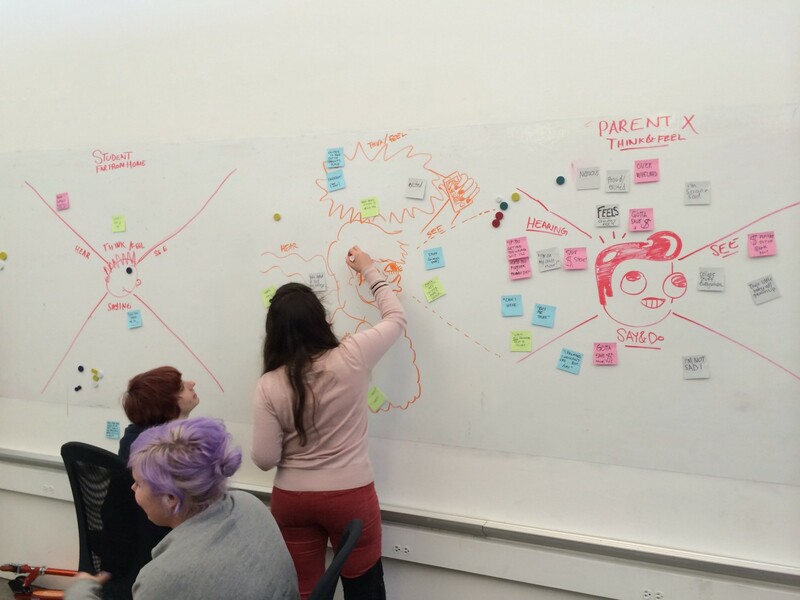 using your body and the world to think more effectively. From a workshop and upcoming book, Design for Understanding, by Karl Fast and Stephen P. Anderson. Fragmenting is his term for reducing complex things (like your sheets and sheets of notes on research) into stand-alone insights that then can be rearranged. The process of fragmenting is really boring and really useful. I’ve done it by hand, highlighting insights in my notes, and then laboriously copying them onto post-it notes. I have cut-n-pasted into a spreadsheet before, then printed it and cut it out for reordering, and maybe it’s faster but something strange happens when I do all that copying. It’s like I wrote the words into my brain. I retain the knowledge of the users in a much more complete and effective way. When you are making fast decisions about product, knowing the users by heart is invaluable. Time spent upfront getting to know the data results in time savings later (and fewer deadly decisions). 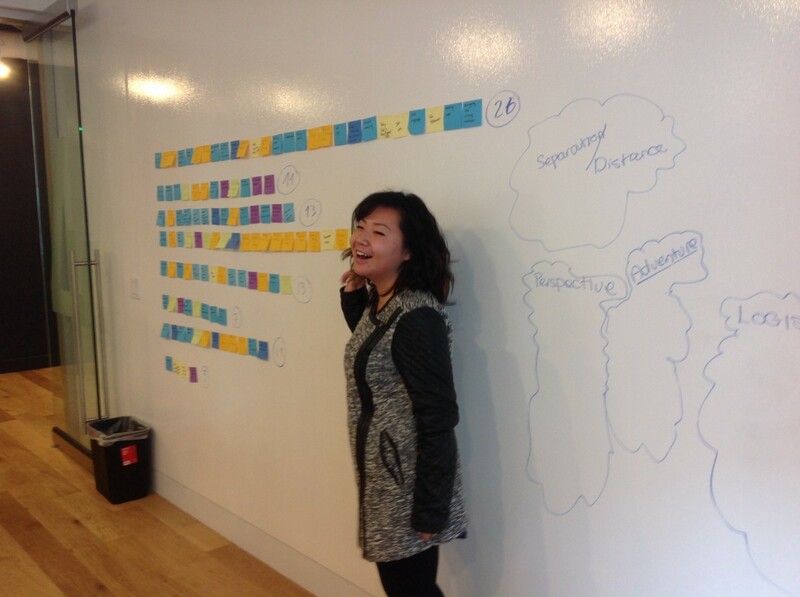 Goal: Make your insights modular so we can rearrange them in order to create new insights. Activity: Gather notes from user research. Highlight interesting bits. Copy those items onto post-its, one per post it. Time: Depends on the amount of research. Recommend doing it BEFORE the synthesis session. Can be 30 minutes or more, but fairly mindless work. 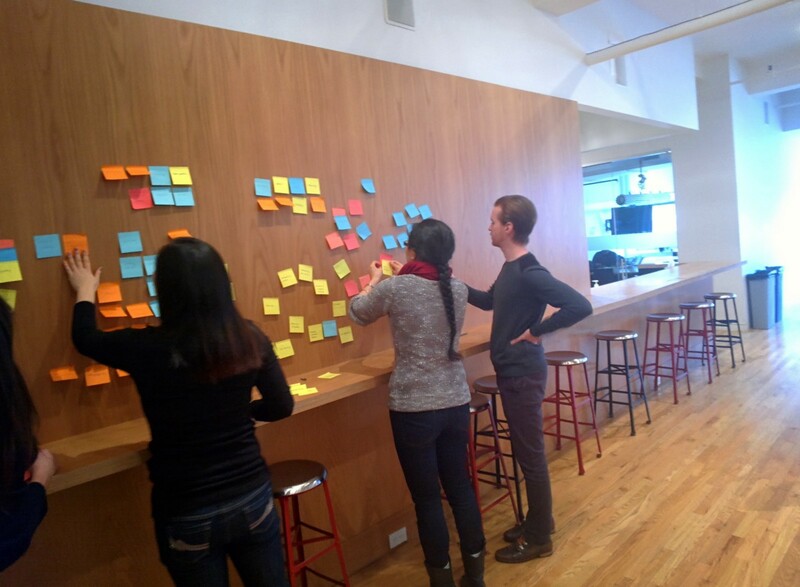 An affinity mapping session at General Assembly, NYC. 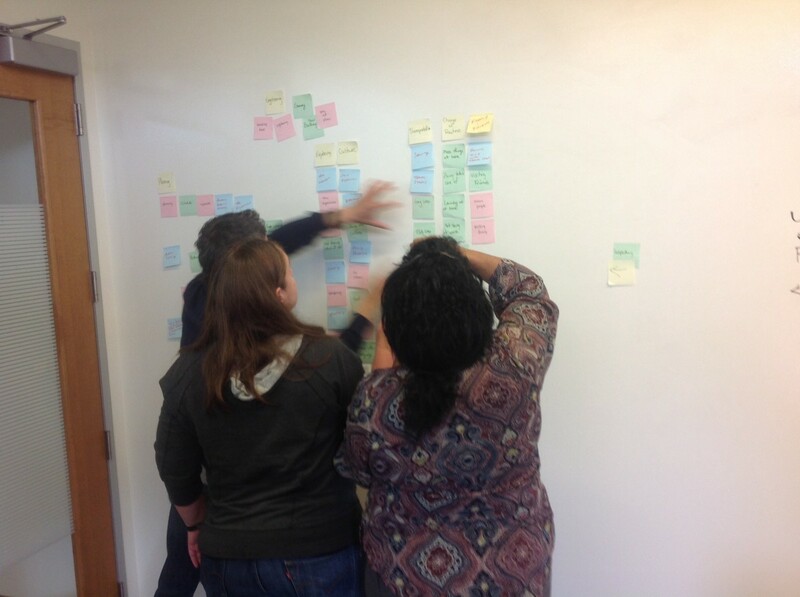 If you are a designer, you’ve probably done affinity grouping exercises as part of a card sort. It’s not very complicated; you just put post-its with similar post-its. No rhyme or reason beyond your gut feeling. I often call this Post-it note twister. It’s about moving quickly, and avoiding analysis paralysis. If you find you are reading each post-it to the group before placing it carefully, you are going too slowly. Get them up on the wall, then take a moment to correct. Goal: By organizing data by similarity, we can see insights we can’t get with chronological organization (notes). Activity: Put post-its with similar post-its. Don’t overthink why they belong together in the first pass. If two post-its say they same thing, put on on top of the other, as a second vote. Time: 5 minutes for first pass, putting like with like. Limit time, so people don’t get caught up in analysis paralysis. Now run a second pass on the data chunks, naming the groups. Examine the groups: are any weirdly unspecific and big? Should some be broken down into smaller sub groups? Do not create a miscellaneous group. Instead, if you have oddballs, set them to the side. Then examine each one. Is it truly an outlier, or is it indicative of a need for more research. For example, if we were doing research on travel, a post-it saying “worried about taxi drivers ripping me off” might be a indicator of a concern about safety, and worth looking over the data or even doing more research to understand it’s importance to travel. Or the group might decide that person is just paranoid, or it’s not relevant to their product space. Sometimes I’ll see a participant not participating, i.e. standing back from the group as they madly rearrange and order. Not everyone enjoys group chaos. I’ll suggest they watch for those one-item outliers, and check if the affinity groups are getting too big. Take your group to post-its and order them by size, biggest group on top and smallest on the bottom. Try to make them look a bit like a chart. Goal: Discover what is “top of mind” — how often themes are mentioned. Activity: Order post-it groups by number of post-its in group. People resist the work it takes, but you’d be amazed how much easier it is to see themes as you rearrange. Remember to document! Everytime we rearrange, we must photograph. Best put up those pictures on wall. When you make a war room with a record of all your work, you create a group memory to support work going forward. No one wants to rearrange all those post-its again. But this is almost always the first big “a-ha” moment. 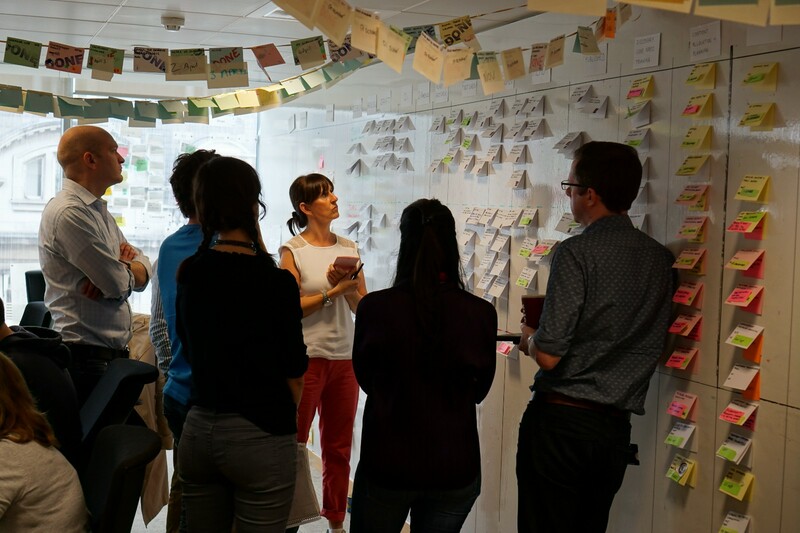 When you arrange the post-its by when they happen in the process, you often discover there are moments that your customers don’t talk about. For example, when we talk about travel, customers frequently talk about planning and being there, but rarely about returning and how they handle their memories. Your team can then decide if that means nobody cares, or if it’s worth going out and doing more research to discover if this is a potential Blue Ocean opportunity. Goal: By rearranging insights via a different criteria (time), we can see new opportunities in the data. Mapping is a technique that uses pre-existing knowledge maps (a.k.a Canvases like the Business Model Canvas) to guide insight creation/collection. Steve Blank once made an offhand comment that you should rank your opportunities by how often they happened in your customer’s life and how strongly the customer felt about it. About a year later, I heard publisher Ray Bard talk about what topics to publish books on, and he used the ocean/well/swamp/desert analogy. Thus this canvas was born. All quadrants are theoretically viable. But some are easier than others. Ocean: a lot of people care profoundly about this need. Downside — often a lot of competitors focuses on this issue (red ocean). Well: Comes up infrequently, but people are willing to spend money to get it right. Think weddings, divorces, yearly family vacation, a new car…. Swamp: a large number of people care very little. You will have to invest in reach, either marketing or distribution strategies. Socks, luggage, gum…. Desert: yeah. um. don’t do that. Goal: Narrow down our list of potential needs to meet, and focus on the one with the highest potential value by mapping to how often it occurs in our user’s lives, and how strongly they care about it. Activity: Make the Frequency/Passion matrix (painter’s tape again!) Pick pains and gains from your previous research insights (dismantling the timeline to a degree). Map your pain/gain post-its to the matrix. Run the frequency-passion matrix multiple times to filter down to the most desirable ideas. Participants should take out everything in the left and lower right, and redistribute the top right post-its to narrow down ideas to the highest value ones. If anyone loves loves loves an idea in the lower right or upper left, they can set it aside in a “parking lot” to explore later. Created by Dave Gray, it’s well documented in the Gamestorming blog post, Empathy Mapping. Goal: Understand a customer’s mind at a decision making moment. If we can understand the environment as well as the thoughts, emotions and motivators, we can build a better mousetrap. Activity: Move Pains/Gains from the previous models to the bottom of the Empathy canvas (you may wish to add more). Name the person you are mapping (preferably wiht an actual name, not just “business traveller”) and choose a moment important to her (from the timeline). Now fill in the canvas, using your research data. This is an exciting moment. 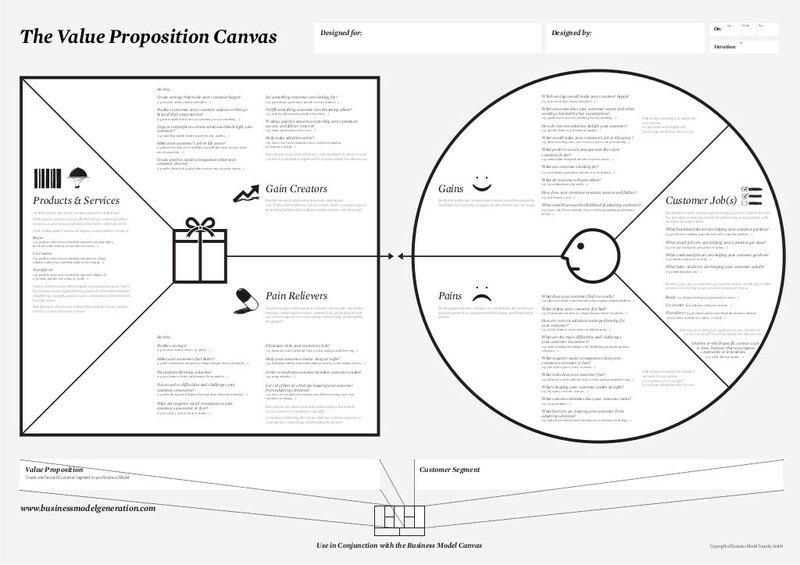 I use the Value Proposition Canvas to move from synthesis to ideation. I.e. 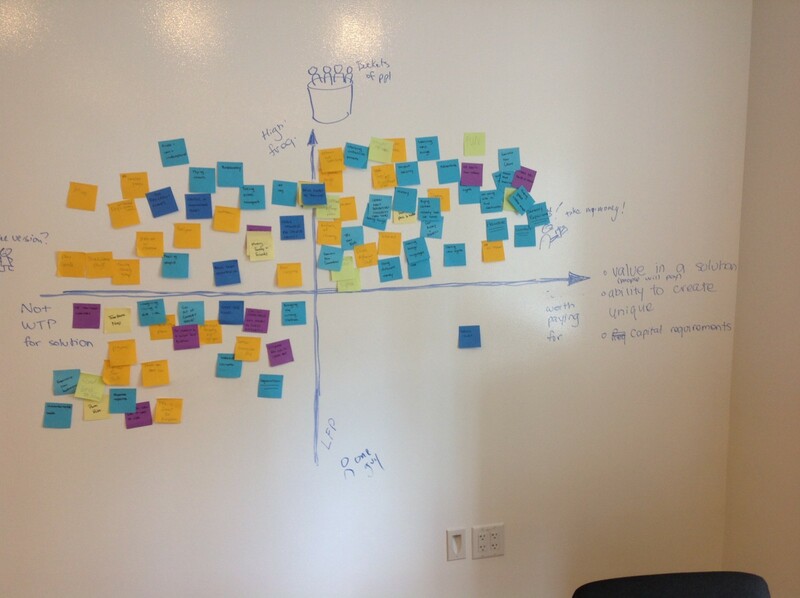 we’re almost done analyzing our data, and we’re ready to start thinking up products and services! This is a publication to collect the writings of the Creative Founder class at CCA.